Wisconsin may be best known as America’s Dairyland, but it has so much more to offer. 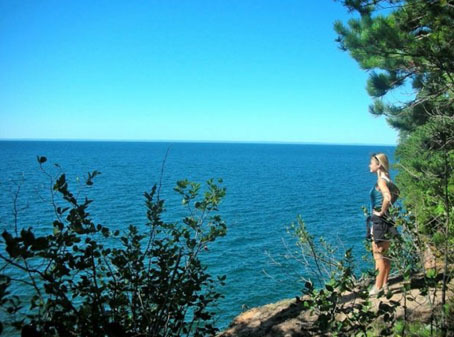 In the Bayfield area alone, there are over 30 revitalizing nature trails. From the picturesque route of the Iron Bridge Nature Hiking Trail, which is under a mile, to the three-mile railroad path called the Brownstone Trail, there’s a beaten path for every type of adventurer to explore. There are more than 50 miles of trails to explore on Apostle Islands. On Oak Island – the highest point among all of the islands on the National Lakeshore at 1,081 feet above sea level – meander through 11.5 miles of maintained hiking trails. Depending on which of the five authorized trails you choose to trek, you’ll find yourself on secluded beaches, campsites, a sandspit, a ravine, and a 200-foot-high overlook that gives you a view of all 10 islands. Remember to stay on the established trails for safety and to avoid trampling on fragile plants. Learn more about hiking on Oak Island here. On Stockton Island, 14 miles of trails lead you to the diversity of the island’s sandy areas. The 0.4-mile Julian Bay Trail leads to Julian Beach, where the sand literally squeaks underfoot. The 2.8-mile Tombolo Trail passes through the namesake landform, a bridge of sand that connects the island to Presque Isle Point. Four other trails bring hikers to an abandoned quarry, an old logging camp, and through forest and bog teeming with a wide variety of plant life. Read more about the attractions of Stockton Island here. If you’d like to bring your dog along on any of these hiking trails, check out the leash laws of the island you’re visiting and whether the water taxi you’ll be taking to the island will allow your pet aboard. On Meyers Beach, the 4.6-mile Sea Cave hiking trail is one of the best-loved on the mainland, the land equivalent of the Sea Cave Paddling Trail. The hiking trail is popular for its beauty, all-season accessibility, well-maintained trails, and breathtaking views. In the winter, the sight of the frozen sea caves on Lake Superior is nothing short of spectacular. Just remember that this kind of outdoor activity is best given time and preparation so you can truly enjoy the experience. Follow our tips for a laidback hike that will put your mind at ease. Stretch and exercise as if you’re training for a fun run. Expect a lot of inclines that will require great stamina and stronger joints. Guzzling down water while you’re already hiking will not help satiate your thirst. A few weeks before the hike, prepare your hydration technique by increasing the intake of water in the body. In other words, get used to drinking more water than usual. You wouldn’t want the weather to rain on your hiking parade so always check the reports. If the Bayfield weather starts getting very damp, then don’t be afraid to reschedule rather than risk your own wellbeing. Bring along snacks that keep you going. Nibble on trail mix, granola bars, sandwiches, and energy-rich food. Practice first on one of your local nature trails. If you can, find a route that’s similar in distance and terrain as the Bayfield version. This is also an opportunity to test your endurance. For starters, you may want to invest in a durable backpack, which can cushion and break your fall. Wear layers that you can easily peel off if the weather turns warm or once you begin to perspire. Don’t forget to wear thin socks to avoid blisters. Even the most careful person might encounter a problem during a hike. Stay vigilant and bring your first aid kit along.Also bring surgical wraps in order to deal with the onset of blisters and wounds. Apply sunscreen whether or not it’s sunny in Bayfield. Always remember to reapply throughout the day, more frequently if you sweat a lot. The hiking trails belong to everyone and to the next generations – they should be treated with respect. Bring a small garbage bag to stash your trash in until you can properly dispose of it when you return to town. Never venture out to hike alone without informing someone of your whereabouts. It would be better if you could ask a friend to accompany you on your first trail. Not only will you feel safer but it will provide bonding time with your buddy.